I’m ashamed to say that what with other committments I have been neglecting the old police bike. I have reached a stalemate with the numberplates. The bike in its original form had a front numberplate (I have photos of the bike from the 1960s) that was hand-lettered. 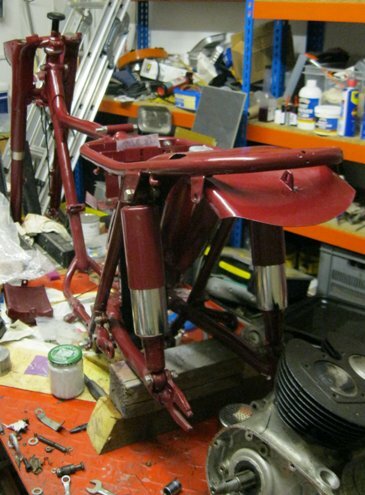 As I am spending umpteen hundred pounds restoring this bike I don’t want modern, stick-on numbers. Until I get the front numberplate done I can’t fit it to the front mudguard, and until I fit it to the front mudguard I can’t underseal that mudguard, nor can I fit the front wheel or connect the front brake. Ho Hum… anyone know a good signwriter, who can work in paint rather than in computer-cut, stick-on letters? After months (years?) of pottering and painting, my old police Triumph is beginning to look like a motorbike again (though you might not think so). 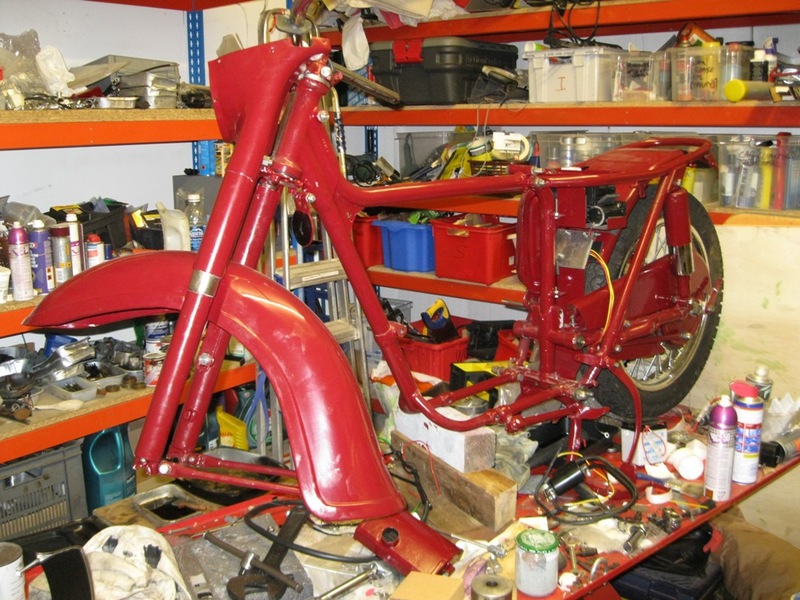 I want to finish restoration by 7th July this year, if only because the bike was first registered on that date fifty years ago. For me, restoration meant just that, dismantling everything and dealing with every part individually, removing rust, treating the steel and sanding and painting with umpteen coats. I suppose I wanted to restore it ‘as new’, though it certainly wasn’t new when I first rode it. I’m not one of those strange people (I almost said weirdos) that own old police vehicles and like to attend rallies dressed as policemen (why on earth would anyone want to do that? Even the thought of it makes my skin creep). Yes, okay. I should have said weirdos. Oh, I’ve just remembered. As you can see in the photograph, I haven’t yet started to rebuild the engine. Well, I’ve taken the cylinder head off and peered at the pistons. Both of them are there, as you can see. I was an engineering geologist for a lot longer than I was a policeman. So why don’t I want to restore a boomer or a petrological microscope? (that’s not me in the photo, honest). Why not indeed? Now there’s a thought… (the Atlas Copco Boomer, not the microscope). Would it fit in my garage? Not a chance. *here. The black bike in the photo is another police bike, one I restored earlier (seven years ago). I bought it to ‘do up’ (and to ride occasionally), then discovered it had been a City of London Police bike. A few years ago I found one of the police motorbikes I used to ride. As you can see if you compare the top and middle photos, it bore little resemblance to my old constabulary bogwheel. 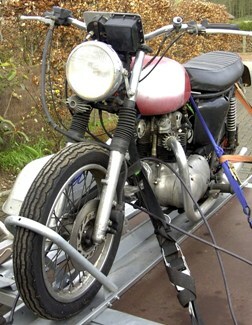 The bike on the trailer is the same bike as the one at the far end of the lined-up trio. Well, not quite the same, as you can see. The bike on the trailer doesn’t look too bad, rust-wise. What you can’t see is all the rust under the chrome plate and the paint. I removed the engine and stripped the bike down. Now I am about to reassemble it. The engine can wait, I shall do that when I have put the rest of the bike together. Engines are like people – no amount of looking at them from outside can reveal their inner secrets. The wheel hub’s inner secret (bottom photo) was scary. I’m hoping that the inside of the engine doesn’t look the same.